We can’t help but think the Salt Vampire, or creature, from “The Man Trap” would be drooling at these, or at least at one of these officially licensed ceramic Star Trek salt and pepper shakers. 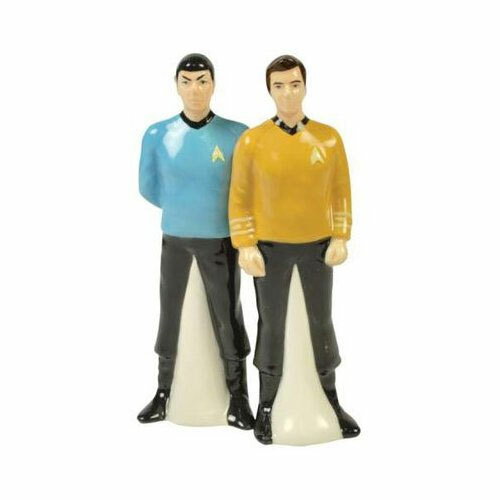 Featuring the likenesses of Spock (Leonard Nimoy) and James Kirk (William Shatner) in classic Trek uniforms, you can keep this command team on your dining room table. Each shaker measures approximately 4.5″ tall X 1.5″ wide X 1″ deep. But which one is salt and which one is pepper? I suspect these things matter to the average Trekkie. Or so I’m told.